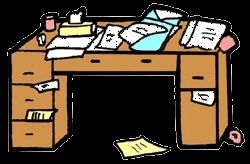 When scheduling and organizing parent conferences or other sign ups such as needed supplies for a class project, does your desk look like this? I know mine does! For example to schedule parent conferences I send a letter home, which comes back to me with hopefully 3 times that would work best for the parent. Then I have to assign time slots to fit into the two conference nights, hopefully meeting everyone’s needs. This time I tried something new! I created a sign up through Sign Up Genius, which then emailed a link to the parents in my classroom. Parents accessed my sign up through the link and selected their own time slot! No more paper passing! No more puzzling through selecting time slots! What a time saver for both myself and the parents in my classroom! I even selected that Sign Up Genius will remind parents of their conference 2 days before their scheduled time. I am also using Sign Up Genius to allow parents to select different food items to bring in for an upcoming writing project. Again, no paper passing, assigning of items, etc. I love when technology works to make tasks simpler so I can focus more on my students and creating creative learning projects and less on paperwork! Awesome idea to use with conference sign up. I use this with the kids athletic meal sign ups and it is wonderful. Can’t wait to hear how it goes.